We've known for a while that Samsung is a huge company, and we've seen a few times that between it and Apple, those two companies cover the vast majority of smartphone revenue. But, now we're seeing what kind of growth Samsung has within the Android ecosystem itself, and it shows that as other manufacturers are flagging, Samsung now holds 46% market share of Android devices. 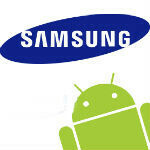 That means Samsung has doubled its share of the Android ecosystem compared to Q3 2011. The difference has been made up by drops in share by HTC, Motorola, and LG, with HTC having the larges year-on-year drop from 32% to just 16%. The "other" manufacturers gained share, but it's unclear what manufacturers really did the gaining there, although the smart money would be on Asian manufacturers like ZTE, and Huawei. We would be hesitant to assume Sony saw growth. The numbers come from MillennialMedia which uses its vast advertising network to measure impressions from various devices. Samsung is almost becoming a defacto choice for Android, but with devices like the HTC M7 on the horizon, do you think other manufacturers can push back? Samsung really needs to be taken down a notch. They push out a device nearly everyday. More isnt better. Exactly, one of Apple's flaws is the a severe lack of variety, with 3 phones currently being sold at a time (not sure if the 3GS still sells). Samsung literally has dozens, if not hundreds of phones in all shapes and sizes, while still maintaining excellent quality on their best phones (Note II and SIII). It is true they make the worst phones ever, but they also make, marginally and arguably, the best phones to date. but it also means they are greedy as hell and desperate as well.........theres a difference between being dedicated and being desparate.....sorry and when samsung feels the heat of competition coming along, you see it in their actions.........THEY COPY in order to place themselves above the competition.......they too need to be "taken down a notch" as captain doug said..
COME ON, Samsung!! Ur so close to 50%!!!!!! ... I said taken down a notch. Nothing about how many devices they release. I have no idea why I'm being hated on. That usually happens. Look what happened to the Westburo Baptists when they started speaking the truth.. I love the "it's everybody else who's wrong, not me..." attitude. The Westboro Baptist Church. You will never find a bigger hive of scum and villainy. Totally! I remember he even stated something like every tech reviewer who gives the GSIII/GNOTEII excellent score is biased. And he'll do a much better job than them. What did I say that was wrong? That Samsung is too big? It's true. Right now, there isn't much competition. That's bad for technology and for consumers. I just think that there needs to be balance. HTC, Motorola, LG, etc need to step up. "bad for competition"???? Heres a thought, have Moto, LG, and HTC come out with something that can compete against the iPhone and Samsung then they will do better. Yes the Google Nexus 4 is a good device(sold unlocked or at&t and had plenty of qaunitity issues). Yes the DROID DNA is a good device(no expadable memory or removable battery oh and its only sold on one carrier). Where as the Note 2 and the GS3 is sold on every major carrier out there :) And Im sorry but I feel that Moto lost their drive and their passion after the succes of the DROID OG and now they simply cant shake the cobwebs of crappy tech and virtually no up to date updates for older devices, they showed their true face in the last year and a half with subpar specs on these so called "amazing" devices. You're comparing me to the WBC? Wow. Classy. Guess consumers dnt mind sammy copying...hw elz do u explain the rise frm 23% to 46%....i mean jst look at the rest evry othrz hav shown a reduction excpt sammy! meloth1991: WHAT?!?!? hw elz do u ezplan hw mch n idot u is????? LOL DUDE MAKE SENSE! Why do you think they need to be taken down a notch? They're just too big. Anther way of saying it is that, other OEMs are too small. There isn't enough competition which is bad for technology and consumers. (I'm quoting myself from an eariler comment). 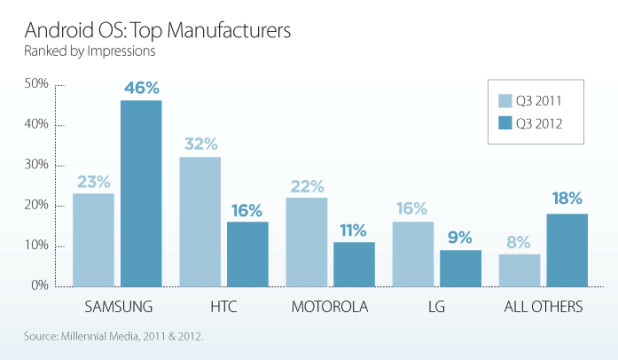 LG and Motorola are HUGE companies that are involved in multiple industries(well moto used to be huge) but they invest too little in their cell phones. I think it not SS has to be taken down a notch, it's other OEMs have to move up a notch or two. I agree, the other manufacturers should try their hardest to lower Samsung's slice of the android pie. I don't mean to seem like I think that Samsung should be crippled. I think that the other Android manufacturers should do what they have to to make their devices more competitive so all Android devices have a chance to dominate through vigorous competition. Yea everyone should only release ONE device a year that looks exactly the same so that why nobody has choices. For me it is. More choices. I really like the big screen on Note 2 and functionality that comes along with it to exploit it. I wanted Sense and HTC's design, it looks beautiful, but I had to choose between looks and functionality. Being what I am, Note 2 did what I wanted my phone to do. Choice is always good. I disagree. Samsung has seen Apple's success and they are now aware of the formula. The other android makers need to get with the program. Custom Over lays with useful features, custom made fast exclusive chipsets and an ad campaign. Forget Samsung, what differentiates the other android phone makes?